An American philanthropist with a taste for Irish whiskey has stepped in to support the salvage operation to recover Gregor McGuckin’s yacht Hanley Energy Endurance drifting some 1,200 miles west of Perth, Australia. Speaking from Fremantle overnight, American tug boat skipper Cody Cordwainer, who is leading the salvage operation said: “Its taking longer than expected. The 60ft sloop we had planned to use has structural problems that are too expensive to repair, so we are back to square one looking for a suitable ocean-going boat. The good news is that an American philanthropist has donated a large chunk of the salvage costs in exchange for the barrel of Glendalough 7-year-old 777 single malt whiskey still onboard and the Distillery has agreed to this. We have made a lot of contacts here and are looking at two avenues: Finding someone with an ocean-going boat having trouble meeting their monthly slip payments who could use the extra cash, or someone with a boat that they want to make ocean-going, and we can do that for them. Gregor McGuckin's Yellow Brick tracker onboard his abandoned Hanley Endurance Golden Globe yacht is running in stealth mode to stop others from trying to salvage the boat according to Race Headquarters. While McGuckin has returned safely to Ireland a salvage bid by American Cody Cordwainer is underway in Australia and in the latest update, Cordwainer explains that The "official" Whiskey Rescue is still in need of a salvage boat. Many people and parties have been inquiring as to the current status of the WHISKEY RESCUE salvage project and I apologize for being remiss in our postings. I arrived of course in Australia on the 16th January and have since then been walking the docks and frequenting the yacht clubs making one connection after another. 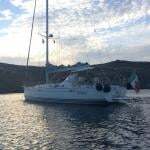 About two weeks ago we finally found what we thought would be our salvage boat, a 60’ motor-sailer with a 185 HP Diesel Engine. 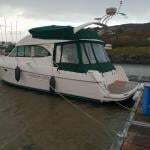 Its owner was an experienced inshore skipper with an adventurous attitude, just the man to work with us on the salvage. Since then we have taken the boat sailing many times, learning the boat and how well we work together as crew. All seemed well until yesterday when I was giving the boat a closer inspection and I crawled into the chain locker. Daylight was visible around the cathead and chain plate and the forestay was pulling out of the deck, delaminating the fiberglass as it went. Expected costs of readying the vessel for the voyage and fuel, food, etc were expected to total around $25,000 but the repair of such a major structural issue would increase the expenditures by approximately an additional $15,000. So while the motor-sailer will remain a backup option, the search is on once again for a salvage vessel. A strong steel-hulled ketch was volunteered but at the last minute the skipper backed out. Today we are back on the docks hunting a boat! It is true that finding a boat for the project is taking longer than originally hoped, but we’ll keep going until the job is done. A famous Carthaginian General once said, “Aut inveniam viam aut faciam.” I shall either find a way or make one. He later proceeded to cross the Alps with around 20,000 troops and many war elephants. If Hannibal could achieve that, we’ll achieve this. Many thanks to everyone who has donated to help Gregor get his boat back! You haven’t been forgotten and you will be entered into the drawing for the whiskey bottle when this is all water under the keel! Please feel free to reach out with any questions. As previously reported by Afloat.ie last week, plans are moving forward to salvage Irish Golden Globe Race skipper Gregor McGuckin’s yacht Hanley Energy Endurance. Cody Cordwainer, a tugboat captain operating out of Brooklyn Navy Yard is set to arrive in Perth, W.Australia on January 16 and charter a fishing boat to take him and his crew to collect the yacht, now some 1,100 miles to the west of Fremantle. Cody is posting all news on Facebook here. Golden Globe Race Organisers are reporting that Irish skipper Gregor McGuckin has accepted an offer from American Cody Cordwainer, a tugboat captain operating out of Brooklyn Navy Yard, to salvage his yacht currently 1,100 miles west of Fremantle Western Australia. In a plea for support for the salvage bid, Cordwainer has posted on social media: “We'll make no profit on this enterprise. The distillery has offered €1000 in return for its whiskey, but that will not even begin to cover all the expenses. We'll need help to make this happen. Funding, of course, is great but we also need contacts in Perth Australia. We'll need a vessel to rescue his boat, and a place to put it once rescued..."
As previously reported by Afloat.ie, McGuckin two groups have expressed interest in salvaging the yacht currently drifting West of Fremantle. The main attraction it seems is the barrel of Glendalough 7-year-old 777 single malt Irish whiskey onboard. Since solo sailor Gregor McGuckin of Dublin was plucked off his boat Hanley Endurance in the Indian Ocean in the Golden Globe round the world race, the dismasted 36-footer has drifted approx 580 miles in an ENE direction and is now due west of Cape Leeuwin. Golden Globe Race retiree Gregor McGuckin is not the only person keen to recover his boat still drifting in the South Indian Ocean some three months after his evacuation. As David O'Brien reports in today's Irish Times Sailing Column, there is a Christmas race on to recover McGuckin’s ‘Hanley Endurance’ now 1000-miles off the Australian coast. The Christmas and New Year festive period is a time for memories – or so it is traditionally said – and there are a few which were brought to my mind from what I have been hearing “over the Christmas….” as that beloved description goes. Gregor McGuckin’s abandoned yacht still afloat and nearing Australia with a cargo of Irish whiskey aboard, which story has been exciting some attention since the Golden Globe Race organisers announced salvage interest in the boat – or the whiskey – reminded me of how I first came to love Jameson when crewing aboard NCB Ireland in the Whitbread Round the World Race. In the cold climes of the Labrador Banks – or thereabouts – shivering in the damp cold air on deck watch, despite all my thermal clothing – the discovery as a newcomer to that crew of a cargo of Jameson being carried aboard for some public relations purpose… and the content of one of its bottles being dispersed to those members of the crew wishing to warm up, via Irish coffee if I remember correctly - and which included me - may not have been what was intended but induced in me a love of the liquid which, over the years since has, in my view, handsomely paid off the manufacturer, irrespective of their ultimate purpose for the seaborne cargo! And then, another memory was brought to me by two intrepid round-the-world sailors Fergus and Kay Quinlan from Kinvara recalling what it was like to arrive into a closed yacht club on Christmas morning…in Cape Town …. No wonder Fergus laughed when he was told there that – having reached South Africa, they were nearly home in Kinvara…. Only the Irish weather was waiting for them…. Following Afloat.ie's update on Gregor McGuckin’s Biscay 36 Hanley Energy Endurance this week, Golden Globe Race organisers now say two groups have expressed interest in salvaging the yacht currently drifting some 1,200 miles West of Fremantle. The recovery of his boat would, no doubt, also make a great Christmas present for Gregor too? Gregor McGuckin's abandoned yacht Hanley Energy Endurance photographed by Golden Globe Race skipper Mark Sinclair (above) cuts a lonely sight in the South Indian Ocean. Sinclair photographed the yacht as he sailed passed it a month after Gregor was rolled and dismasted. An incentive to potential salvors is a barrel of Irish Whiskey onboard that has, according to Race HQ, generated a lot of interest.